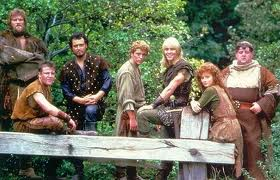 This passion for the legend, and the simultaneous admiration for those who wrote, produced, and starred in Robin of Sherwood has recently been ignited further with the news that the cast have reunited to form an audio show, which follows the sort on from where the television left off, over 30 years ago! 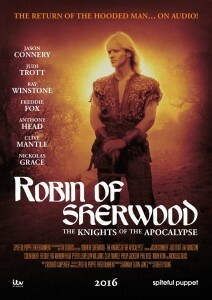 Thanks to the kindness of the producer of #KOTA I have been allowed to promote my work a little on the various Robin of Sherwood fan sites- and I have been overwhelmed with the love out there for a show that has been missing from our screens for such a long time. 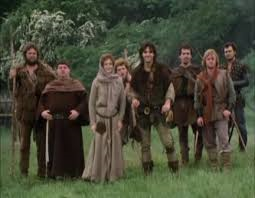 So- what is it about Robin of Sherwood that ignited the imaginations of so many- to the extent that, all these years later, an annual Hooded Man get together is still held every year in Chepstow, and the tickets for the premiere of #KOTA sold out in only a few hours. I am sat here on a warm, sunny day in 2016, asked to write a few words re. 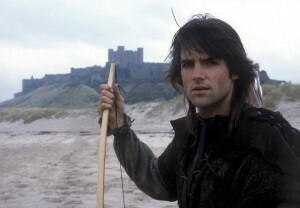 Robin of Sherwood’s enduring appeal. A few words cannot possibly do justice to a show which has managed to shape much of my formative years, provide such pleasure, enjoyment, and focus. It has picked me up on not so great days, prompted warm fire-side discussions about comradeship, history and legend, and given me life-long friends, propelling my own personal journey of discovery. How do you repay a man – the legendary screenwriter Kip Carpenter, for providing hours worth of storytelling of this legendary English folk hero? How to thank the actors, the crew, the directors and the money men who all sprinkled their magic ; let people push the envelope of their skills, having the freedom to do their best work – research, set the mood, and to sit down and lend their feedback to the stories so that they grew ‘richer’ than ever expected. I think because we’re dealing with such legendary material and archetypes, this is the main reason we are still here today talking about a tv series. There’s a rebel in every one of us, not one of us hasn’t dreamt about trying to right wrongs and make a difference. Who hasn’t run through woods, walked through empty arched doorways, dreaming, and then shouting aloud high from up in the battlements of a forgotten castle ruin. No matter the age, we are forever young. Whilst the flesh may die, ideas are bulletproof. We saw our hero die, and then “reborn,” to go on to more exciting adventures. It kept moving and kept evolving, following the same gang of close knit brothers-in-arms, each with their own unique story to tell, their personal demons, and all fiercely loyal. Music, art, history and myth rolled into a neat package that warmed our hearts, albeit for just three years, has managed to do that for thirty and is in no apparent hurry to be forgotten as we come full circle and start a new (old) story, in a brand new medium. It’s a series that will stay with me for the rest of my days. “For me, the enduring appeal of RoS is down to a couple of things. Firstly, it’s always felt timeless, but still very much of its time. By that I mean that, as a seven year old I loved it for the adventure and the black and white, good versus evil that I saw, and as an adult, when I came back to it, I saw it more in shades of grey, as my more grown up mind (allegedly!) saw the characters as grown ups. I wanted to be Marian when I was seven; galloping on horseback through the countryside behind Robin and wearing a crown of flowers to wed. Then, twenty odd years later when I came back to RoS, I wanted to be Gisburne’s stable hand (but then I do love a good antagonist!). The look of and feel of RoS is at once both the epitome of the 1980s and totally timeless – the landscapes, the soundtrack, the acting still feels fresh today (even if the pace is a little slower than what today’s kids would be used to), and holds up for a modern audience. It was shot, and edited, with such love, and you can see that in every single scene. HTV brought Kip’s vision of mysticism and medieval politics to the screen so beautifully, and that fusion of magic and more earthly struggle was really potent. I could fill this blog with many many more testimonials very similar to those above. I’d like to thank Dan, Christine, and Fay for taking the time to send their thoughts to me, to share with you today.